Enter the user name here. If this setting is activated, the user will no longer be able to log onto the portal. If this setting is not activated, the account will not be locked despite an expired password, failed login attempts etc. The individual settings made here have priority over the settings made in the Security guidelines. When new users are created, the settings made in the Security guidelines will be automatically applied to them. 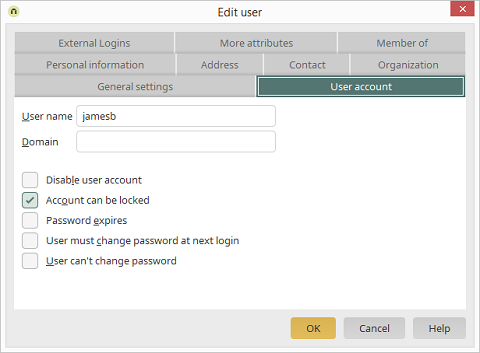 Accounts are automatically locked, for example, if a user enters an expired password or fails to login correctly multiple times. This is determined by both the settings made in this dialog as well as those made in the Security guidelines.